We're working on our third (calendar) month in Vieques now and are starting to get a good feel for what it costs to live around here. It's clear we can afford it, as long as we don't live too high on the hog. But we knew that was a requirement going into these adventures. One of the challenges of this early retirement plan was to see if we could live on a tropical island within a budget, and still have plenty of fun. The lifestyle that we traded in for this certainly provided us with more money, but left me continuing to work in the meat-grinder of high-tech. 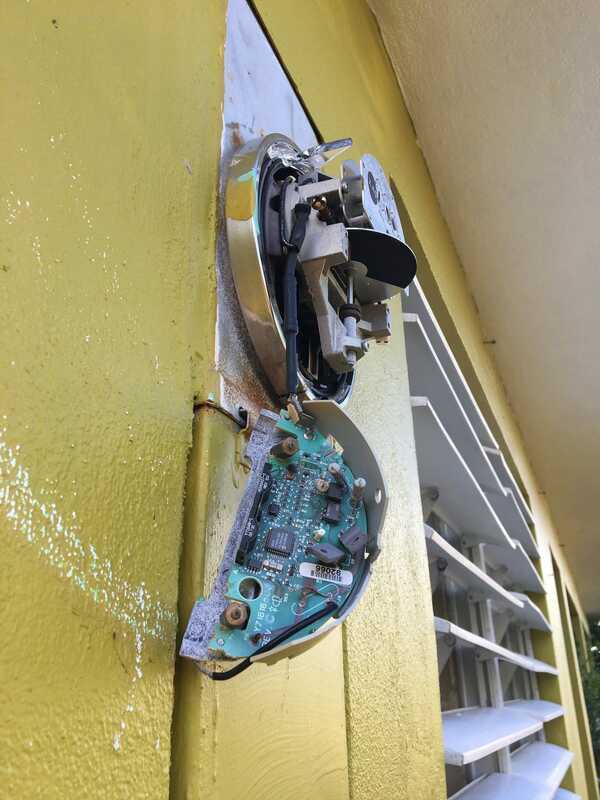 Some of the costs on Vieques are skewed a little by post-hurricane chaos, by direct and indirect effects which may push the cost of something up. 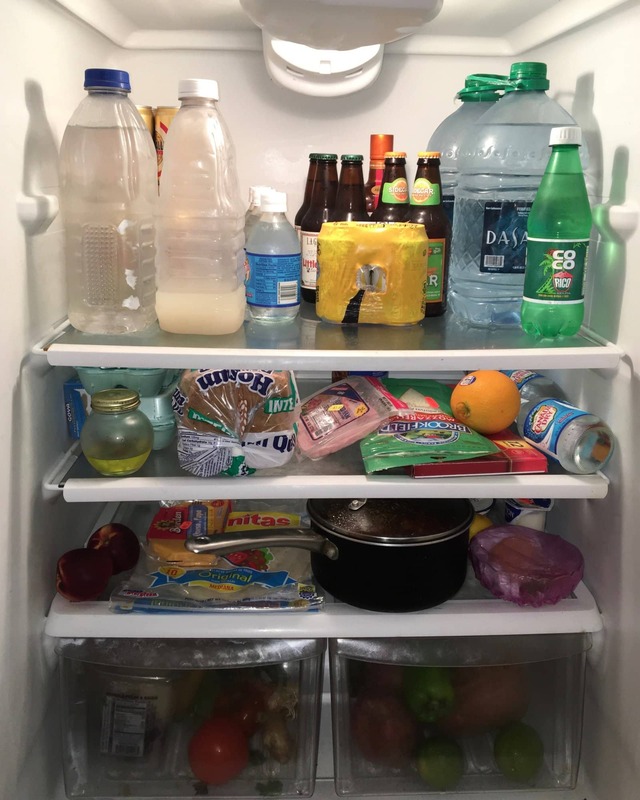 For example, someone that used to import beer or some favorite speciality items may have left and not returned. So someone else may pick up that business as a sideline and not do it as cost-effectively. That said, at this point 5 months post-hurricane, I suspect many of these costs are relatively close to normal. We're still trying to figure out if the costs here are higher or lower than Roatán (we already know that almost all places we're likely to visit are going to be more expensive than Utila). Note water bottles are there to keep it cold when the power goes out. It seems to me that the cost of living here is comparable to Roatán, some things higher, some lower. It's probably a little cheaper in Vieques but to be fair, we weren't in Roatán long enough to learn ways to save more $s. It could be even better, but is driven up a bit here because so many of the foods, basic and specialty, are from the U.S. The quality tends to be high, but so is the price. But it's not a huge difference. In a way I'm surprised that the cost is comparable to Roatán since that island is so tourist-centric (more so than Vieques), which would drive up costs. But Puerto Rico's proximity to the U.S. keeps costs up, as do some of the draconian laws around this U.S. territory. There is a U.S. law nicknamed the Jones Act, which requires that all goods transported by water between U.S. ports be carried by U.S.-flag ships, constructed in the U.S., owned by U.S. citizens, and crewed by U.S. citizens and permanent residents. I'm a proud American, but this restriction favors the U.S. maritime industry at the expense (literally) of the little people who pay more for goods because of it. We absorb the cost and move on, but sadly there are many poor people in Puerto Rico who are hurt by the higher costs associated with this century-old law. BTW, people in Hawaii, Alaska, and Guam hate the law too! As for us, at this point we are spending in the neighborhood of about $3500/month. I believe this will settle around $3000/month once we're fully settled ourselves. A few one-time expenses here and there drove it up a little, for example the travel in January, and bikes, other “stuff”, and stocking up on food, but we haven't yet bought a car or anything really expensive like that. It doesn't hurt that we don't have an electric bill, which likely would run a couple hundred bucks a month. It's either because FEMA is paying for the diesel to run the town generators, or because our electric meter on the house is demolished, or both. Probably both, which means even when they get us hooked back up to mainland power, we won't get an electric bill until they figure out which houses have broken meters. We could get free electricity for months! Haha! Umm, don't tell anybody, OK? 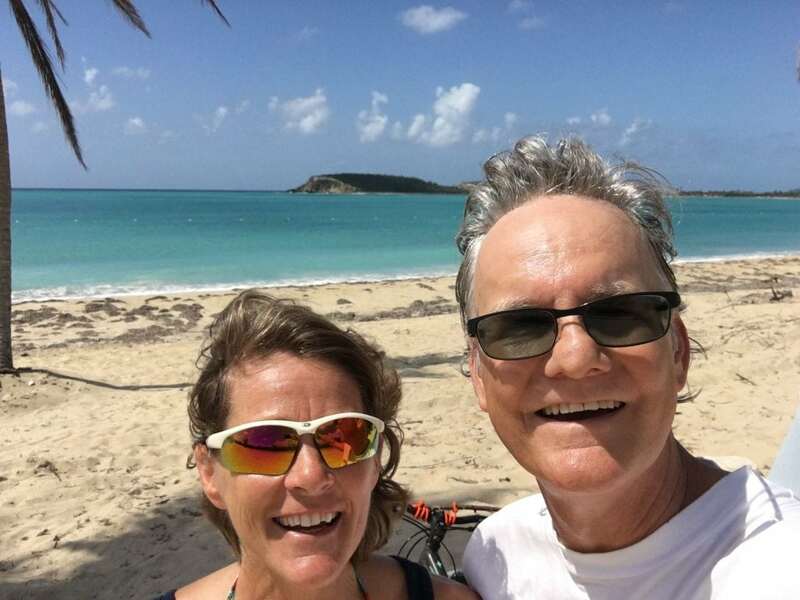 One of the keys to inexpensive living for us is getting out and enjoying the island on bikes, going to beaches, visiting sites like the abandoned naval base buildings, or the pier that the Navy left behind. All of these things are free, and there are countless more places to explore even as we wait for more of the nature preserve to open (more beaches!). We are also fans of yard food and we've certainly been blessed here. 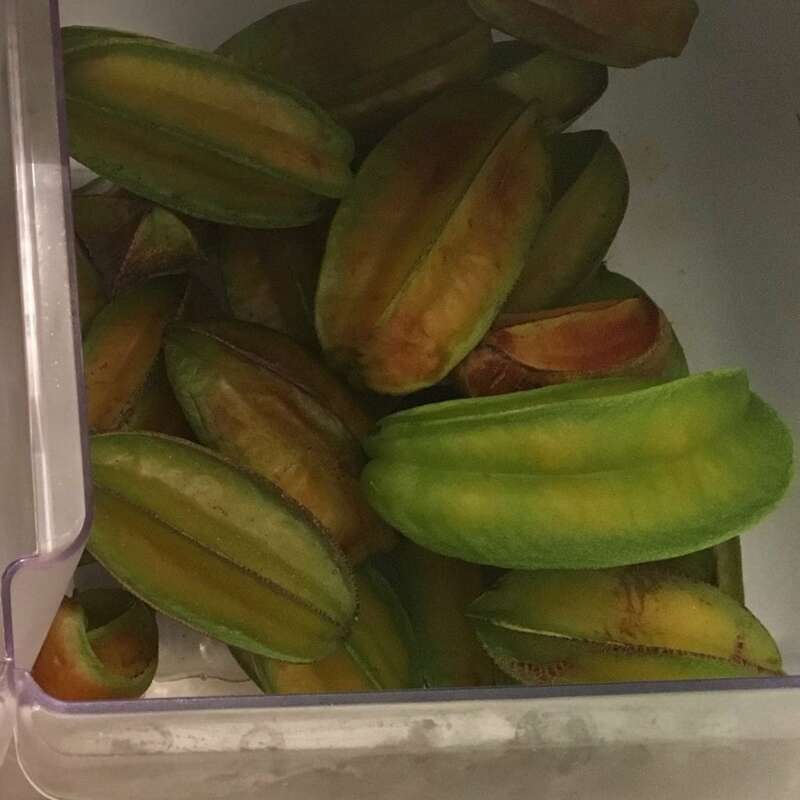 We are still using up the last of the carambola (starfruit) harvest; we had so much we had to give some of it away to friends. 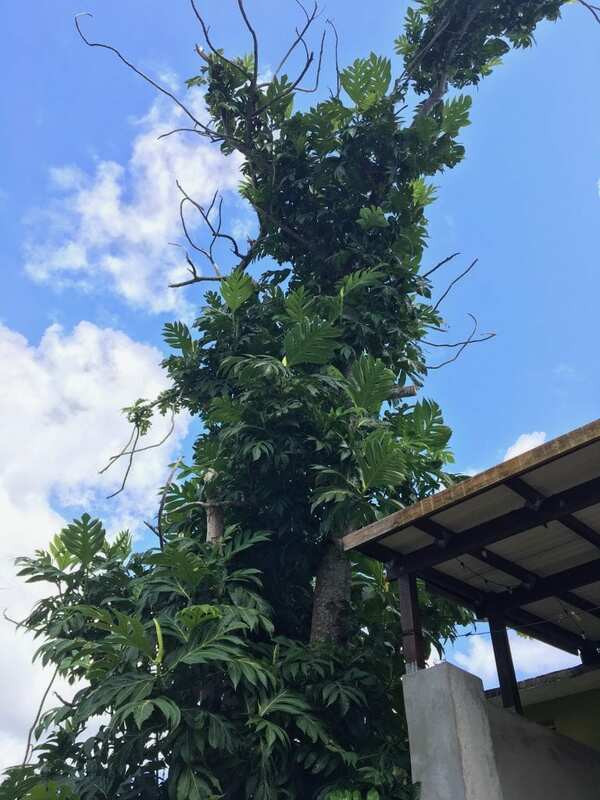 We've been told our avocado tree has the best fruit on the island, although it may be a while before it recovers from the hurricane shock. Also, it's about 20' tall - not exactly pruned for high yield or for harvesting. 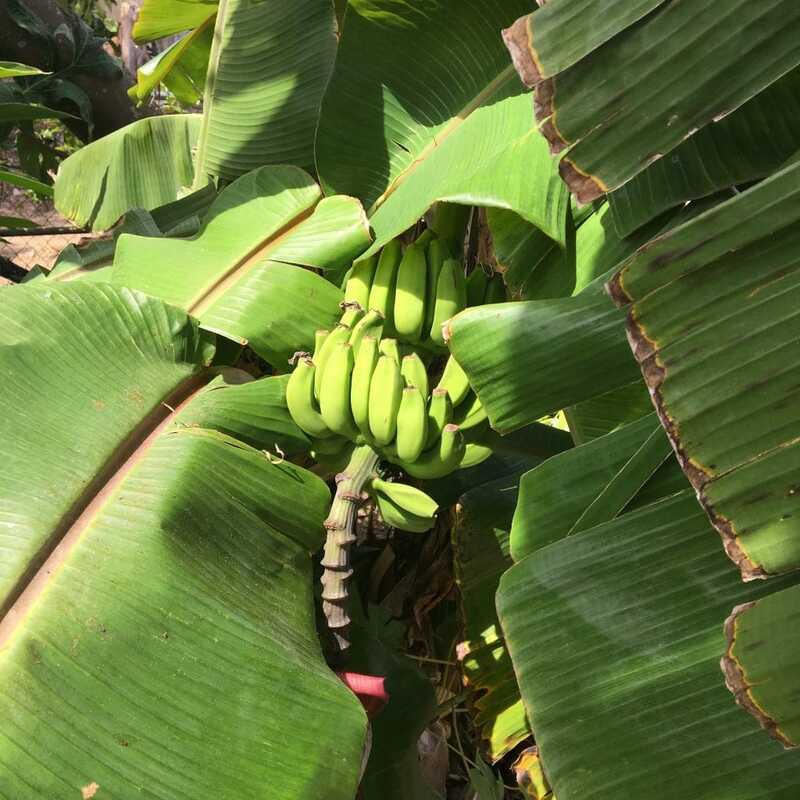 But we do have a small bunch of bananas growing low on one of the many banana trees in our yard. Are they supposed to grow upward? We are also surrounded by breadfruit trees which are yet to produce. 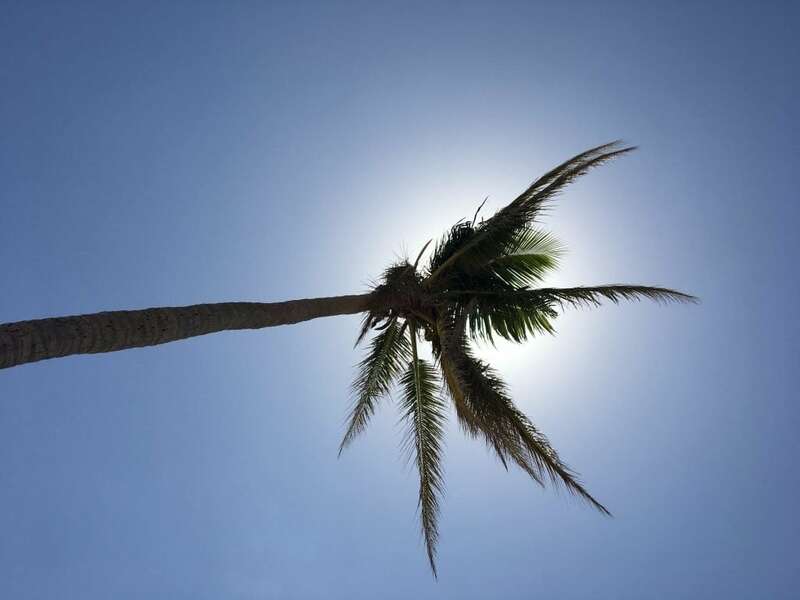 There are several of them, but as a result of 175mph winds, at least 2 of the largest ones are leaning at a 45 degree angle, onto the mango tree. 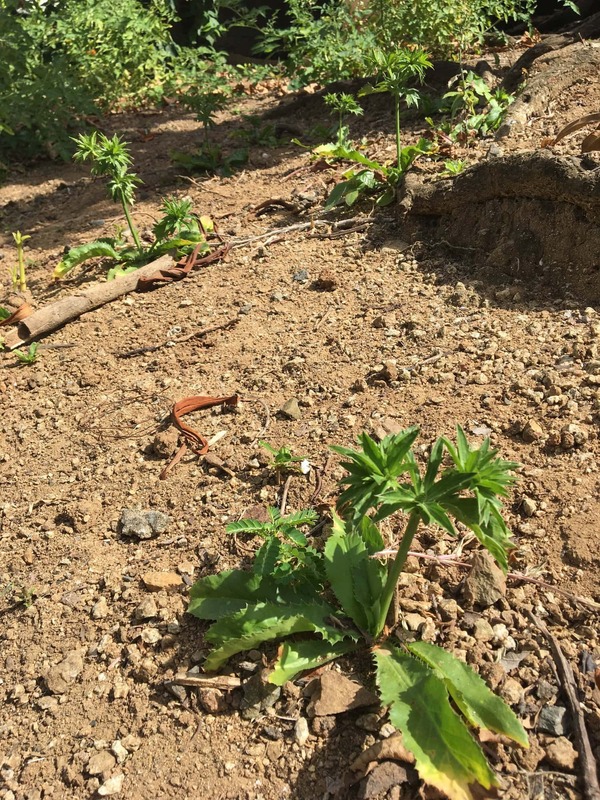 This breadfruit species is not waiting around to see what happens in the next storm, they are sprouting from the roots all over the place, by the dozens, working to maintain the bloodlines. We're trying to select the right sprouts, some of which are 3' tall already, and cull the rest. The mango tree is another beast, it's about 25' tall so harvesting will be a challenge. That one is really testing our patience because we love mangos! And then there are the cherry tomatoes which volunteered all over the yard. We enjoy them, and funny, so does Kirby the dog. He goes searching for cherry tomatoes and comes back proudly carrying his booty to eat on the porch. It's pretty good individual gathering skills for a species that's known to be pack hunters! We have a seemingly endless supply of these little treats. Deb also discovered wild cilantro in the yard so she is cultivating that. Although I have to be careful with her, back in Colorado she was known for feeding the kids and I weeds from the yard and calling it a salad (she claims to this day that it was arugula that she planted)! 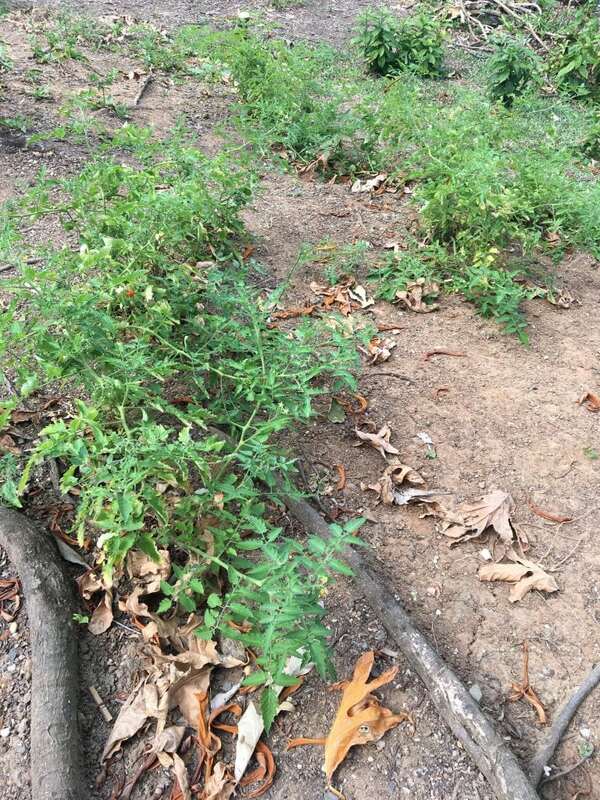 Cherry Tomatoes all over the yard! His name is Sebastian and he lives there, right next door to the Colmado. We rode with him into town for an appointment and some errands. When that was done we noticed Sebastian sitting waiting for a fare over near the ferry dock, so we hopped in again. He was talking to a guy and we heard him say "vecino" which means neighbor, cuz we are his neighbors! 🙂 On the way home we noticed a van with a hand-written sign that said $20 for cleaned fish – we couldn't tell how much fish, what kind, etc. But Sebastian immediately pulled over and waved the guy over. He got out and came back with a bag full of fish, dropping it into a dishpan between his front seats. Obviously, he'd done this before! There were probably 8 yellowtail snappers in there, easily over a pound apiece. They had no smell and looked like they had been swimming in the ocean that morning (clear eyes, good color). While I was evaluating the fish and starting to come to the realization that we should have bought our own bag of fish, Sebastian had us halfway home. But next time we're getting the fish! So, can we do it? Can we live here on a tight-ish budget and enjoy our lives? We are enjoying our bike rides, meeting new people, learning new traditions, and exploring the island. We'll be able to do more of that when we have a car, but of course there is expense with that. We couldn't do this if we ate out every day, but we wouldn't enjoy that anyway - we've never been big restaurant people. We probably eat out once a week, and have drinks out a little more often than that. It works well with our lifestyle. It remains to be seen long-term if this will all work out, but I can say without a doubt – so far, so good! TODAY'S SPECIAL: Livin' Easy, by KBong (feat. Stick Figure), cuz we jam dis aw da time on da beach, yes I ! I’m glad things look like they going to work out there! How long do you think you see yourselves staying there vs island shopping again? I think we are hoping to stay here for years. God willin and the creek don’t rise ?, and do short island hopping tours from here. We are in the Spanish Virgin Islands now. Our neighbors are the U.S. Virgin islands and British Virgin Islands. All a stones throw. But for now…I’m tired of traveling and don’t even want to get on the ferry to mainland Puerto Rico. You guys have balls (figuratively Deb) the size of breadfruit! You’re living the lifestyle many people fantasize about, but never quite pull the trigger due to fear of change and the unknown. Super happy for both of you!! Thanks Mark! It’s funny, while you’re doing it step by step, it doesn’t seem so amazing, but now that we are living our Dream, it is amazing. And really you jumped in with 2 feet for your adventure too, and jumped hurdles! Careful when you harvest bananas. Look around every side of the bunch. The bunch tends to turn into an insect hotel. Spiders follow. It occurred to me you could save $$ by growing veggies if so inclined. Look in YouTube under “tropical food forest” for inspiration. THANK YOU Oscar! I will always listen to the voice of experience, especially when it comes to avoiding spiders. 🙂 We will be growing some things for sure, starting with basil and tomatoes. I’ll check out the tropical food forest too, thanks again. I’m shocked you discovered a law that is outdated, worthless, insulting to your intelligence, penalizing to people of all incomes, and will never be gotten rid of. Shocked, I tell you, shocked! I don’t see it changing, ever. I’d love to be wrong. Love reading your posts…we feel our journey to The western states…and moving here was our adventure…bottom line which we feel is our mantra…live where you vacation..still true. That’s exactly right Marsha! You guys are the perfect example of people who follow their dreams and enjoy life to the fullest! Hey Guys. Sounds`like all is going well and I am so glad for you. I like the idea of growing your own veggies. Maybe you could have a stand and pick up some dollars? Wait, that would be work. You have been there and are done with it. Right? This!! This is where I’d love to retire to as well. Maybe cya soon!! I’m wondering how you two are faring, it appears it’s been 6 months since your last comment. I was raised in Bayamon, then ended up raising my family in Oregon. I miss the island so much! We’re 9 years away from planned retirement, but I’ve been dreaming of ditching waiting and moving to Vieques! Hi Suzie, I commented on this but that appears to have been swallowed by the Internet goblins. This page is only one post of the whole blog, so it won’t get updated unless someone like you comments on it. 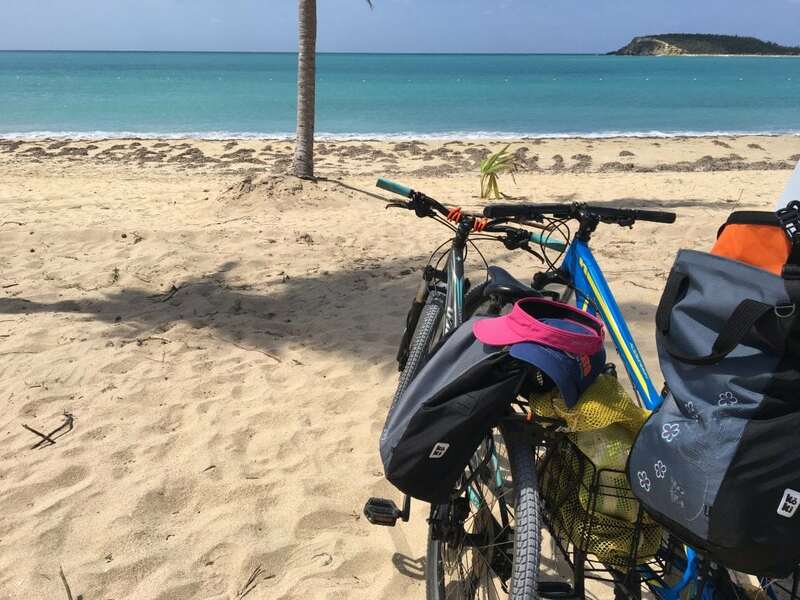 The full blog is here: https://kneedeepinit.com/blog/ and you can read all about our Vieques adventures. The start of the Vieques stuff can be found right here: https://kneedeepinit.com/keep-them-doggies-movin/ and from the bottom of each post you can click through to the next one, or the previous one. Or at the top, click the “Blog” Link to go back to the full list. Hope this helps, and I hope you enjoy the blog. Although my wife and I think of how blessed we are to live in Miami every winter I dream of how much better life would be in Vieques. Was there before the hurricane and totally loved it. Here is the rub…I’m a registered nurse detoxing patients from drugs. No hospital in Vieques that would pay me nowhere near what I make in Miami. Wife is a procurement manager who could possibly get to do consulting work via the internet. Considering going back to school to get an IT degree with the sole purpose of someday being able to work from home. What sort of IT degree would you recommend? Hi Will, the winters here are amazing, amazingly pleasant. We still go in the water in the winter, we rarely even hit the low 70s. In general, and I’ve lived in Florida for decades, it’s warmer in the winter and cooler in the summer here. That said, the shock of moving from Miami to Vieques might kill you! Miami is a cosmopolitan beach city. Vieques is Mayberry in the Caribbean, and probably has its own Sheriff Andy and Deputy Barney Fife (except they speak Spanish). As for hospitals, they DO NOT EXIST on Vieques. There was one before the hurricane but it has been condemned. There is only a triage clinic now and anything serious goes to the mainland. Anything worse than stitches or a sore throat and it’s a plane or helicopter ride. So for jobs, sorry there’s not much there. As for an IT degree sorry, I don’t really know. But an online job is a good idea. Good luck with your Vieques quest! Everything in life is a big trade-off. Thanks for such great, entertaining information! I’m arriving in Vieques this Friday for two months(or longer) to do a Workaway at the Lazy Hostel. Can’t wait and already have the skinny on the pros and cons. Plus my son went there and said he thinks I’m going to totally dig it! I’m currently wandering the planet without address and am really excited to go to “Mayberry” and call it home! Thank you Donna, maybe we’ll see you at Lazy Jack’s one day soon.